Red diamonds, longevity fruit or fruit of immortality – the nicknames for the Goji berry are promising. Their mysterious powers for health, beauty and longevity have led them to be endorsed by celebrities like Madonna and Elizabeth Hurley. So what is actually the story behind the mysterious Goji berries? protect against age-related diseases such as Alzheimer’s. Is there any evidence for the benefits of Goji berries? Are there any possible disadvantages? 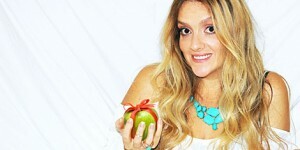 And how do you actually eat Goji berries and incorporate them in your daily diet? Here is the definitive guide to all you ever wanted to know about Goji berries. Goji Berries Recipes – From Starters to Desserts! Goji berries grow on bushes that are as high as one to three meters as ovoid fleshy berries during the fall season. They are shriveled, red berries closely resembling red raisins; however, their color is a deeper red. They fall in the category of dry fruits and are tiny in size. When they are ripe, Goji berries are so tender that upon harvesting, it is essential to shake them from vine into trays to prevent the risk of spoiling. After that, they are dried in the sun to make them slightly chewy. Goji berries are then sold dried to the consumers. How many calories are in 100g of Goji berries? How many calories per tablespoon of Goji berries? What about other nutritional values? Here is the complete breakdown. Based on this nutrition breakdown, how many Goji berries should you eat per day? A serving size of one tablespoon (about 15g) is a good starting point. Goji berries are suitable for cultivation in temperate and subtropical regions. Therefore, they are usually grown in the evergreen shrubs of Tibetan Himalayas, Mongolia and most widely in various provinces of China. The largest plantations of Goji berries total 200,000 acres in central and western regions of China, Ningixia Hui and Xingjang Uyghur, respectively. 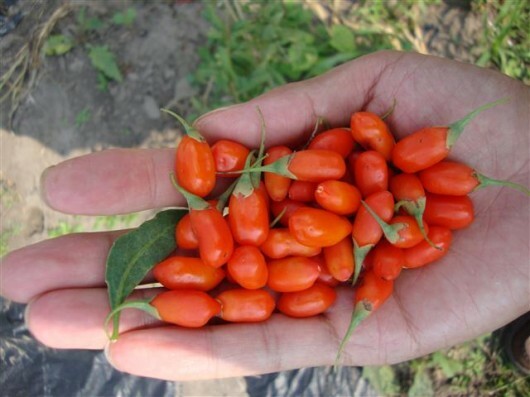 However, the best quality of Goji berries is found in the floodplains of the Yellow River in Ningxia, sometimes. Other areas of China that produce Goji berries commercially are the inner regions of Qinghai, Shaanxi, Gansu, Shanxi and Hebei. The use of Goji berries dates back to over 2000 years ago. The exact roots of the name are Potential explanations include a possible influence of the part of Himalayas called Gojal, which borders the Hunza Valley, one of the major origins of Goji berries. 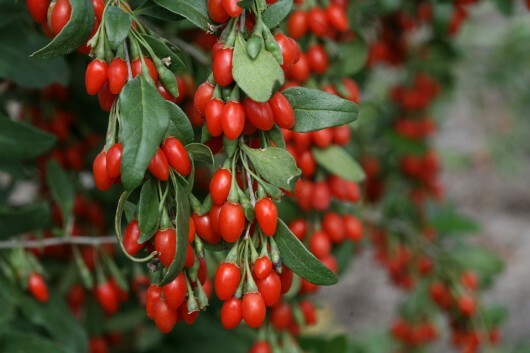 Goji berries are sometimes referred to as”wolf berries.” This stems from a Chinese legend that a great wolf used to feed on these ripe berries in the dense patches of the Gojal area. More plainly, it may also be related from the Mandarin root word, gou, meaning wolf or confusion over the genus name, Lycium, which resembles lycos, the Greek word for wolf. The earliest mentions of Goji berries are for medicinal purposes in the first century BC. In these mentions, Goji berries are claimed to have anti-aging properties. Goji berries are used as herbal medicine since the past 2000 years. Several Chinese myths regard Goji berries as the”fruit of immortality”. During the prime of the Tang Dynasty (618 – 907 A.D.), a caravan on the Silk Road stopped for a rest at an inn and noticed a young girl reprimanding an old man. The girl replied, “I am disciplining my great-grandson. It is none of your business.” Everyone at the scene was shocked by her reply. Further enquiries revealed that the lady was more than three hundred years old! The old person was being punished because he refused to take a type of herb and started to age. The timeless Indian science of life, Ayurveda also recognizes Goji berries for its useful medicinal properties. 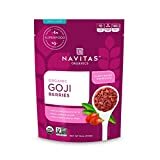 In addition to herbal and medicinal uses, Goji berries have also been long used in several Asian dishes as an ingredient or for garnishing purposes. 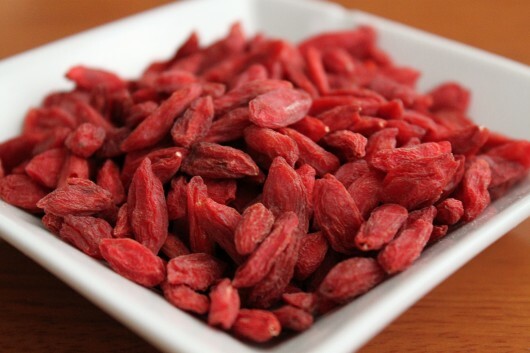 Goji berries come in several forms such as raw, dried and powdered or seeds. The Goji berry seeds vary according to the region of cultivation and their size. Usually, Goji berries consist of 10-60 very tiny yellow seeds that lie compressed with the embryo. Dried Goji berries, just like any other dried fruit, have higher nutritional value than their regular version. The high content of bioactive ingredients in dried Goji berries enhances their medicinal and dietary qualities. Dried Goji berries are just deprived of moisture and still contain all nutritional content. This makes them a bit higher in sugar and calories. Fresh and raw Goji berries are less popular because of their delicate nature. They contain higher content of Vitamin C compared to dried Goji berries. 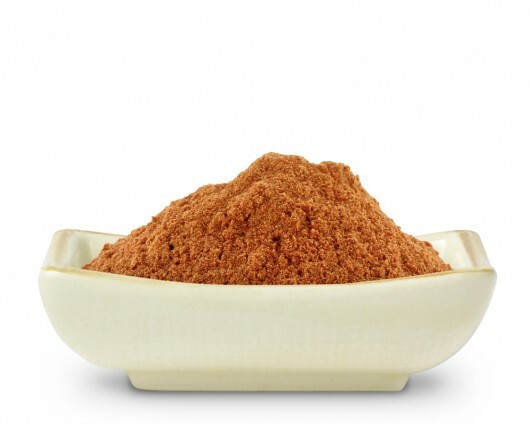 Goji berries powder has become increasingly popular. This is because it can be mixed with water to make Goji juice. The powder is also easier to beldn with other fruits to create smoothies or juices. A couple of teaspoons can also be used with hot beverages such as tea a to give them an antioxidant boost. Or sprinkle Goji powder onto desserts, Muesli or yoghurts. The increasing popularity of Goji berries has flooded the markets with Goji berries extracts and supplements for daily use. 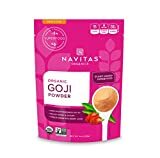 Goji berries extracts supplements are found as regular powder and in capsules. There are also mixes for special use cases, such as weight loss. The Goji Advance is a mix of Goji berry extract and green tea leafs extra, for example. The most famous and expensive of these grades is”super”. As compared to the lowest quality berries;”grade A”, Goji berries categorized as”super” are 41% more expensive. To fall under the”super” category, there have to be about 240 berries per 50 grams whereas there are about 480 berries per 50 grams in the”grade A” category. The best berries are grown on the longest planted bushes. The older the bushes, the better the quality of Goji berries. This is because longer established bushes also yield larger berries. The dryness of Goji berries plays an integral part in their quality. 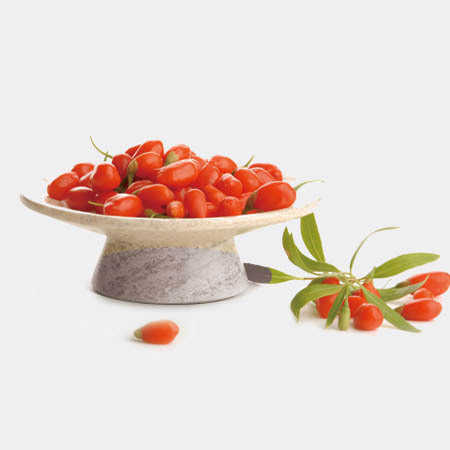 The most optimized dryness results in Goji berries with only 10% of moisture content. When soaked in water, they readily plump up. Using them with soups and cereals is easier because they soften quickly. They can be easily stored. Packed with minerals, proteins, anti-oxidants and vitamins, Goji berries have been regarded as having miraculous powers for keeping the body healthy and energized. Many health claims have been made for Goji berries’ benefits, including maintaining a healthy heart and circulation, boosting the immune system, protecting against cancer and increasing longevity, yet the medical evidence to back up these claims is weak so far. Goji berries have a high concentration of anti-oxidants. Antioxidants target free radicals in the body that cause cancer. Therefore, a common claim is that the anti-oxidants in Goji berries can prevent cancer from developing, although there are no serious clinical studies backing that up (or the claim that anti-oxidants prevent cancer, in general, for that matter. Furthermore, Goji berries have been associated with the boost of required enzymes that hinder the expression of oncogenes, the cancer causing genes that some people may inherit from their ancestors. Again, there are no clinical studies backing this claim. Goji berries are good source of Vitamins such as A, B, E and C. The high content of Vitamin A makes Goji berries beneficial for eyes. Furthermore, it contains a compound called zeaxanthin, which is known to prevent age-related degeneration of the eye. According to research carried out at Hong Kong Polytechnic University, daily intake of Goji berries increased blood levels of zeaxanthin that helps reduce the probability of vision loss due to macular degeneration or glaucoma. 100 gram of fresh Goji berries contain 12.3 gram of protein. Compare that to chicken breast, which contains 23 gram of protein per 100 gram. It’s doubtful you can eat 100 gram of Goji berries, so the impact as protein source is negligible. Thanks to the rich fiber and anti-oxidant content of the Goji berries , they may help to regulate the concentration of cholesterols in the blood. This reduces the risk of heart attack and coronary heart diseases. Like all berries, Goji berries have a high nutrient density. 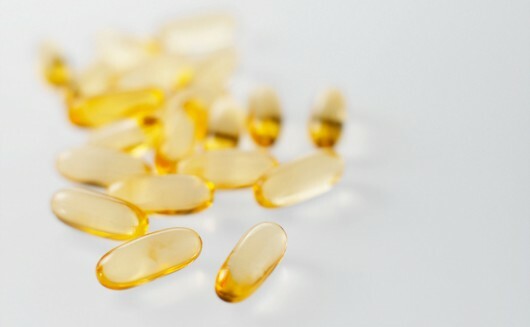 Especially the Vitamin D is known to boost a person’s immune function. Goji berries have been shown to improve immune response, including enhanced antibody production, in a study on mice. Human studies on this are not available. Goji may be beneficial for treating male infertility. This is indicated by a research study on rats in the Wuhan University of China. This study showed an improvement in reproductive function and spermatogenic dysfunction in the tested rats. There are no studies in humans confirming this, though. One research study in Hong Kong has shown that Goji berries have neuroprotective effects against toxins in aging-related neurodegenerative diseases. Please note that there can be adverse interactions if you consume Goji berries while taking medication for diabetes or blood pressure, or if take blood thinners. So be sure to consult your health care provider if that is the case. Owing to the rich anti-oxidant content, Goji berries are beneficial for a clear, glowing and wrinkle-free skin. There are a variety of everyday beauty products that use Goji berry extracts in their ingredients to help soothe your skin from stress and provide a nourished and rebalanced skin. The antioxidant properties of Goji berries leave the skin smooth and soft just after your first application. 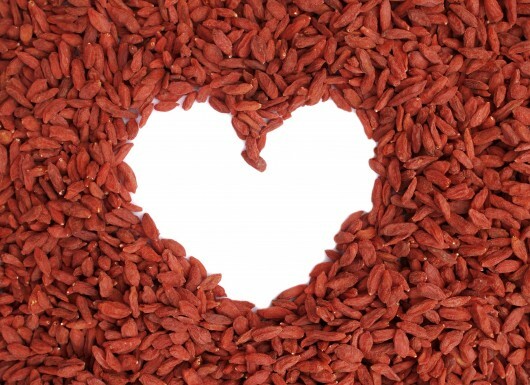 The action of the enzymes in Goji berries is beneficial for your skin. The high number of minerals in Goji berries helps keep your skin nourished and healthy. To sum up their effects, they help fight off the free radicals and their damaging effects. The minerals in Goji berries also help promote the production of favorable protein elastin and collagen that keep the skin taut and wrinkle-free. The amino acids in Goji berries help in keeping the original tone and color of the skin. They also keep the skin hydrated. Vitamin C is a widely known ingredient for its therapeutic effects on the skin. It helps in wound healing and saves the skins from free radical damage. Cartenoids help in maintaining the natural glow of the skin, by preventing damage from the sun. Blend a handful of Goji berries with a small amount of yoghurt and/or milk. Apply to face and neck. Avoid contact with eyes. Leave it on the skin for about 5-10 minutes. Use as often as needed or two to three times is usually recommended. There are a variety of ways you can use Goji berries in your meals, whether it is just for snacking, salads, starters or in complete meal. Using Goji berries in soups has been one of their very popular uses since the earliest years of their discovery. 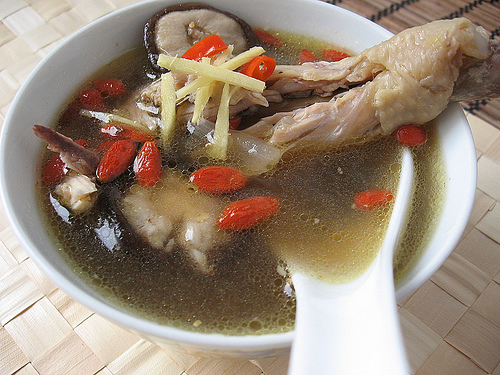 Several modern Chinese dishes still use Goji berries in soups for added taste. 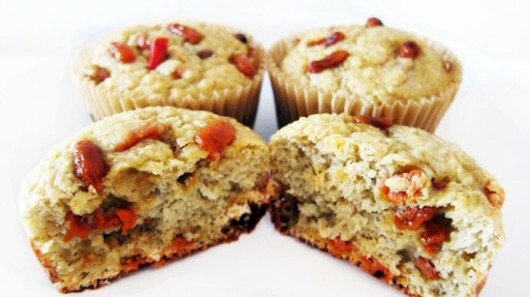 Just as raisins are a popular choice in muffins, Goji berries can also be used in the same way. Their chewy and sweet taste easily blends perfectly with muffins and scones. 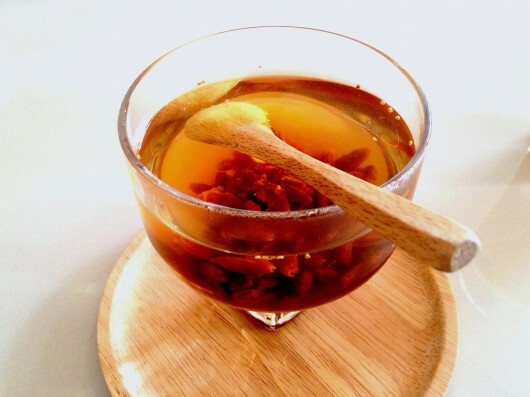 Add Goji berries to herbal tea and let it settle down and hydrate for approximately 5-10 minutes. Soaking them in tea makes them plump and juicy. You can then drink the tea and eat the hydrated Goji berries together. 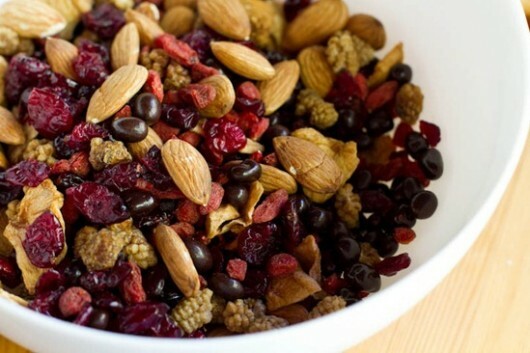 Blend Goji berries, walnuts and other dried fruits according to your taste. Include a few dates for additional taste. After blending this mix, it can be rolled into balls or bars that are easy to use and tasty to eat. Although Goji berries are great for snacking on their own, they can also be mixed with other dried fruits and nuts to make your own trail mix for the family. In a hurry in the morning? Just throw some Goji berries into your cereal mix and you have a healthy start to your day. A perfect solution to a hot day is a smoothie with Goji berries! Follow this simple recipe to make a refreshing Goji smoothie. Soak Goji berries for about 10 minutes in water. Once they are hydrated and look plump and juicy, mix them into the smoothie. This will not drastically alter the taste of your smoothie yet will provide all of the Goji berries’ nutritional benefits. 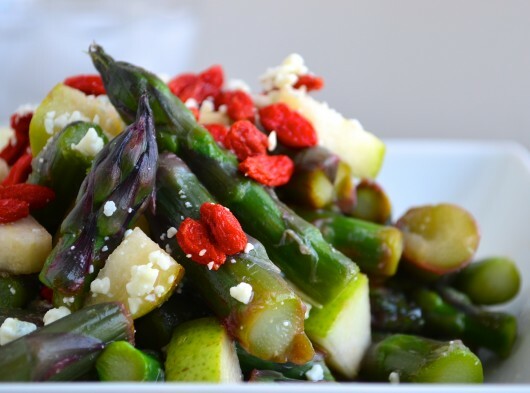 Salads can be easily customized with your favorite fruits and vegetables. Goji berries have become increasingly popular for use in salads because of their unique sweet-sour taste. 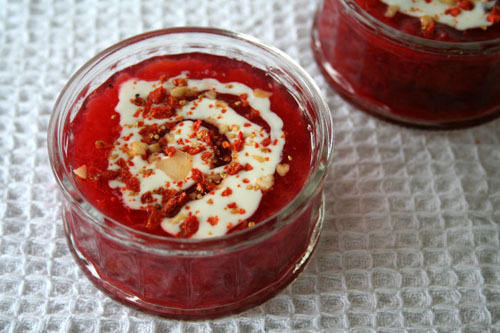 Perhaps the most delicious use of Goji berries is in desserts. Spinkle them on a creme brulee, blend them with yoghurt, add them to a cake -the possibilities are endless. See later in our guide for some dessert recipes. Goji berries can make tasty, fresh juices. Use Goji berries with other fruits to make mixed fruit drinks – especially popular in summer. Goji berries are also used together with other fruits. For example, a popular use of Goji berries is with frozen bananas and peanuts. 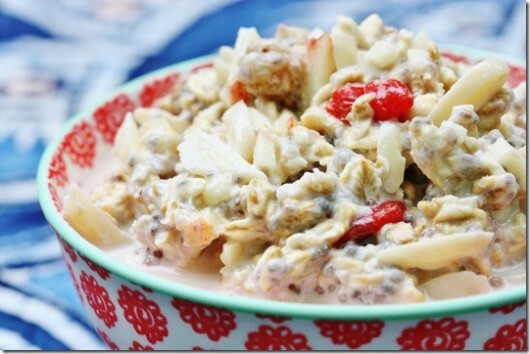 For a nutritionally balanced power breakfast, the Coconut-Goji Breakfast Bowl is a delicious option. It is not just a boring oatmeal bowl; it consists of a number crunchy, creamy and chewy ingredients that give you energy to start the day. Add 1 cup of water and/or your desired milk in a bowl. Throw ½ cup of instant oats and heat it in for about 1 minute. Now include Goji berries with the coconut flakes, together with a blob of almond butter. Sprinkle the bowl with salt and cinnamon. Mix thoroughly and enjoy your quick breakfast. Muffins are quick and easy to eat at any time of the day, and with Goji berries they are highly nutritional too. What do you need for 12 muffins? About four cups of rolled oats that are blended into oat flour. Mix oats with other dry ingredients after blending them with oat flour. 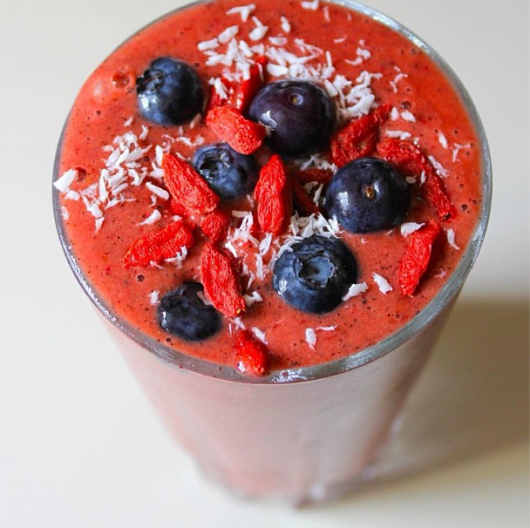 Blend dates and Goji berries together. Add Chia seed mixture and mix thoroughly. Now, pour the wet mixture do the dry mixture, and mix as much is required. Add more milk if it looks too dry. After several minutes, use muffin tins for the mixture. Sprinkle the remaining coconut to the top of the muffin mixture. The baking time should be about 20-15 minutes. Make sure they are fluffy and not to moist inside. Cool the muffins for about 30 minutes. Store the muffins in a cool and dry place or refrigerate them to be used as quick breakfast option. Simply start by using a small pan and melting the butter and syrup together, add rolled oats, cinnamon and hazelnuts. Thoroughly mix and spread on a baking sheet on single layer. The baking times should be approximately 25minutes with a temperature of 190°C or 375°F. The time can be changed according to the appearance of the granola, which should be golden brown and crunch when ready. Keep stirring after every ten minutes. After cooling the mixture, add Goji berries and mix well. Serve with milk or yoghurt according to your taste. A healthy and energizing breakfast defines how the rest of your day will unfold. This Goji Quinoa Breakfast Bowl gives you the right energy that is quick and east to have as your breakfast. Start by mixing water, coconut milk and quinoa in a saucepan. Take a few minutes and let the mixture boil. Remove the pan from the oven, combine the coconut milk, water and quinoa in a saucepan, and start boiling. Then reduce the heat almost completely for approximately 15 minutes. Cool the boiled mixture for about 5 minutes. Add use quinoa in a separate bowl and add cinnamon, flax and hemp seeds. 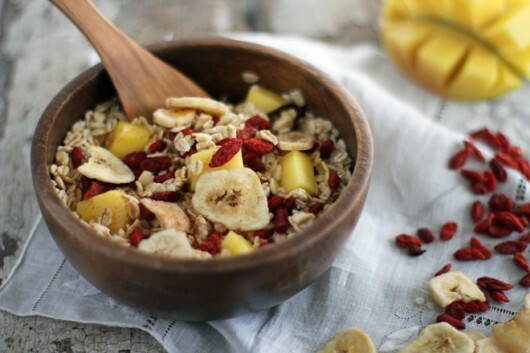 Mix everything and add a few slices of bananas with Goji berries on top. Use 1 tbsp. 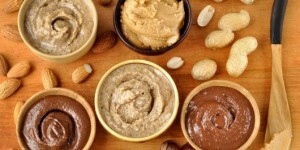 of Coconut powder or almond butter according to your taste. Start by soaking Goji berries and Chia seeds in almond mile or non-dairy option like water for about 30 minutes. Blend apple, ginger, cinnamon, coconut and almond milk together. Combine the mixture of apply, and soaked Chia and Goji berries. Mix well and it is ready to eat. For a yummy sweet sour tasting Goji sauce use the following ingredients, blend them well until smooth. Use 1/2 cup of Goji berries and keep them soaked in water for at least an hour to make them juicier. 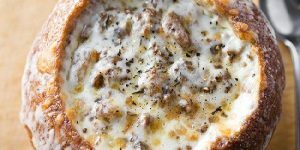 Use the sauce with your favorite snacks or other meals. Start by adding cooking oil in a saucepan and heating it on medium heat. Include chopped carrots and fry for approximately 3 minutes. Also, sprinkle some minced ginger at the same time. Add chopped mushroom, stir and cook for a few minutes until you feel the mushrooms are tender. Now add garlic, salt and black pepper according to your taste and keep cooking for about a minute. This is the time to add your vegetable broth. Bring everything to gentle boiling for about 10 minutes. 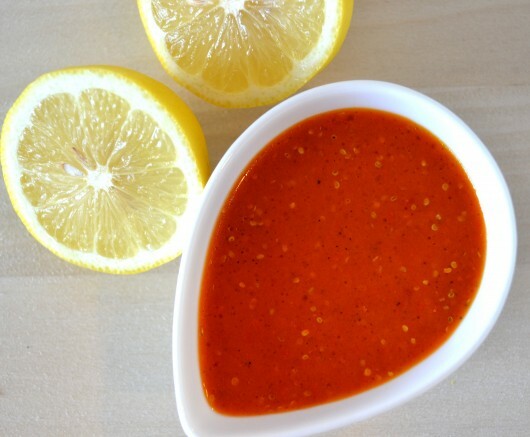 Use the lemon juice and of course Goji berries and simmer until Goji berries soften. Remove the pan from heat, add spinach and serve hot! There are no restrictions to the number of fruits and vegetables you add to this salad, you can let your imagination go wild and experiment! What do you need for 6 servings? Use 1 can or about 15 ounces of kidney beans or 1 1/2 cups of cooked and dry-packaged kidney beans. Make sure they are rinsed and drained. Include 1 can or about 15 ounces of black beans also called pinto beans; alternatively, use 1 1/2 cups of cooked and dry-packaged black beans. 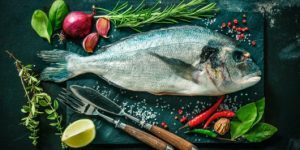 Keep a supply of 12 to 16 ounces of broiled or grilled boneless, skinless chicken breast, sliced according to what suits you. Add and mix all the ingredients. Refrigerate and then mix again before using in the final recipe. 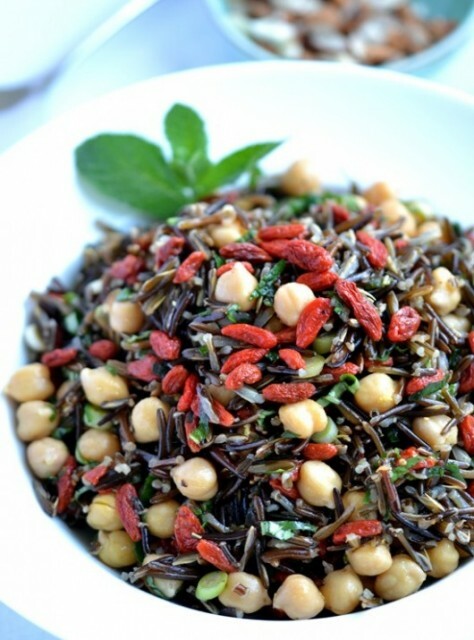 Combine the rice, Goji berries, beans and peas. Now pour 2/3 cup of vinaigrette and toss the mixture. 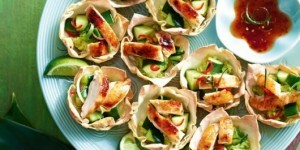 Line the plates with spinach, add salad on the sides and arrange chicken on top. Include the beets on the sides and drizzle the remaining 1/3 cup of vinaigrette. 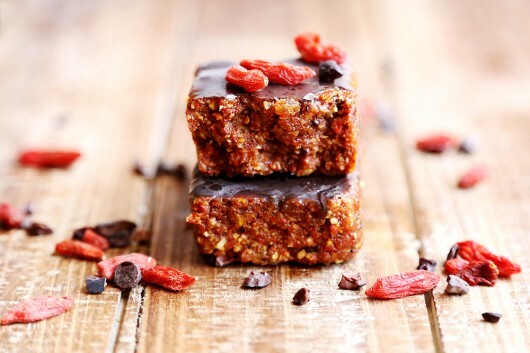 With the spiritual uplifting qualities of Ginger and health benefits of Goji berries you do not want to miss this super tasty and highly beneficial dessert! Start by peeling the pear and then quarter them lengthwise to core. 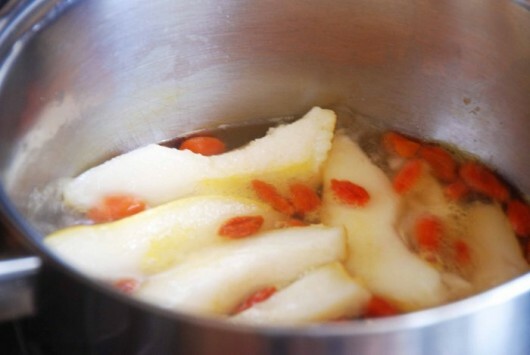 Make thin slices of pears and use a saucepan to add them with apple cider and ginger root. Boil the mixture, reduce heat and keep simmering for 15 minutes until the peers are tender. Add cornstarch in 1/3 cup of cold water and pour in the mixture with pears. Keep stirring until the sauce becomes thick and clear. Serve it either warm or cold. Having a glass or two of Goji berry juice helps make the metabolism strong and improves the nutritional value of your dietary intake because of its tremendous health benefits. If you are too busy to go and buy Goji berries, having easily available Goji berry juice is one of the best options to incorporate them in your diet. 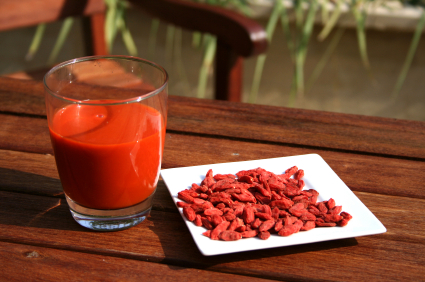 You can also chew these plump Goji berries as you drink the juice. 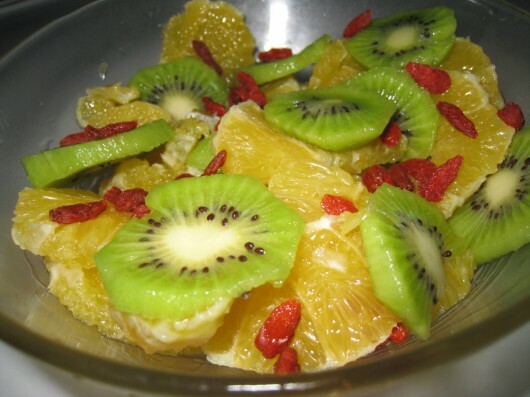 Add these fruits in a blender with a cup of water or orange juice and enjoy throughout the day. It is like an elixir of live energy to make your day more productive! 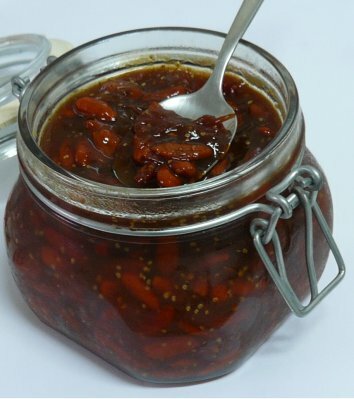 Jams are another wonderful way of enjoying the benefits of Goji berries. Jams can be used for snacking or also for a quick breakfast with bread. Blend until pureed for a jam, add 1 cup coconut or purified water for a juice. Start by pouring water in a saucepan and adding Goji berries so that the water covers them completely. Start boiling after adding the liquid sweetener and lemon juice. Now add the agar-agar powder. Thoroughly mix the contents and simmer for about 7 minutes. Keep stirring the mixture. Keep adding a little water now and then to prevent the mixture from sticking to the pan. The berries will be seen caramelized and inflate when cooked. Use a jar to pour the jam and enjoy it for breakfast, or in between meals. Unfortunately, buying Goji berries regularly is quite expensive. But fret not: there are various methods to cultivate your own Goji berries at home. Goji berries are actually not very difficult to grow. This is because they are able to tolerate light shade; however, they grow best under lots of sun. If you have decided to grow your own Goji berries, make sure you opt for started plants instead of seeds because it is much more difficult (and takes long!) to grow Goji berries from seeds. The following are the directions to grow your own Goji berries in containers. You can buy Goji berries plants even on Amazon.com. Place the plants with their roots in a jar or container. 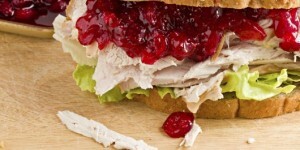 Make sure you add water of room temperature and let them soak for approximately 15 minutes. Make sure your container is well prepared. The recommended size of the container should at least have a depth equivalent to a bucket of 5 gallons. It is mandatory for the container to have drainage holes in the bottom. When you fill the container, make sure there is 2-3 inches of space at the top. To keep pushing the loose soil back in, dig a hole in the middle that is a couple of inches deeper than the point where the root meets the stem. Water the Goji plants well and keep pushing more soil around the plant if you deem necessary. Keep watering the plant and let it remain moist until you see the first sprout which can be expected in about two weeks. If your plants are inside, make sure they have access to as much sun as possible. The more sun they get during the course of the day, the more berries they will produce and the more nutritious those berries will be. Goji plants should get at least eight hours of direct sunlight per day. If you can’t give them enough sun inside, you might consider putting a floresenct, full spectrum light over them for a few hours a day. Pruning is normally done in the winter, but they can also be gently trimmed throughout the season. You will not want to prune them heavily the first year. Identify the largest, healthy shoot, which will be the main trunk. Gradually remove the lower lateral shoots, with the goal in mind of keeping the trunk clear for the first 15-inches, and then when your Goji plant reaches 24-inches, remove the growing tip in order to stimulate the growth of additional side branches. To prune adult plants, remove the branches above the height that you wish to keep. You should maintain clearance from the ground up of about 15-inches. You can also identify any ineffective branches. These usually grow very fast, straight and smooth and will not be very productive, so if they aren’t essential to the overall look, they can simply be removed. Remember that Goji berry plants grow similar to a weeping willow. If allowed to grow un-pruned you can end up with a mighty plant. You should always prune the plant after a heavy berry season as berries are produced on new growth only.